Bha mi air leth toilichte cothrom fhaighinn a bhith aig a‘ bhùth-obrach seo anns a’ Bhlàr Dhubh 19 den Chèitean, is Barry am fear a shnaidh ath-riochdachadh na cloiche Cruithnich againne ann am Baile a’ Chnuic. 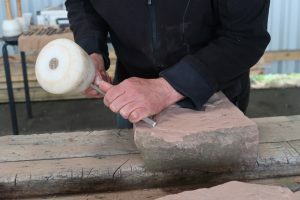 Chaidh an tachartas a chur air dòigh le ARCH (Arc-eòlas airson Coimhearsnachdan air a’ Ghàidhealtachd) mar phàirt den t-sreath “Experimental Archaeology”, a thilgeas solas air sgilean is teicneòlasan nan linntean a dh’fhalbh air dòigh phractaigeach. On a bha daoine ann, inbhich is clann, nach robh cho eòlach air Clach Bhaile a’ Chnuic ‘s a tha sinne, thòisich Barry le bhith ag innse dhuinn mu sgeul is mu shiubhal na bun-chloiche, bho na Cruithnich a shnaidh i anns a’ choimhearsnachd acasan air Machair Rois, gu Caibeal Naomh Mhoire faisg air làimh, gu Caisteal Inbhir Ghòrdain, gu Lunnainn, agus gu Dùn Èideann. Sheall e dealbh mhòr den obair-shnaidhidh air a’ chloich agus mhìnich e cho sgileil ‘s cho prìseil ‘s a tha i, ged nach eil fìor fhios aig na h-eòlaichean air na tha na samhlaidhean a’ ciallachadh. A dh’aindeoin sin tha na h-ìomhaighean àlainn is cumhachdach, tarraingeach fhathast gus an latha an-diugh. An uair sin thòisich e ri sealltainn dhuinn ciamar a rinn na Cruithnich – agus e fhèin – an obair-shnaidhidh, le innealan simplidh: òrd-maide agus gilbean. An tòiseach feumaidh tu am pàtran mìonaideach a tharraing air an leac, an uair sin geàrraidh tu loidhne-muigh fhaiceallach leis a’ ghilb gus oir na h-ìomhaigh a dhèanamh tèarainte. Agus a-nis chaidh leigeil leinn fhìn feuchainn! Bha pìosan cloich-ghainmhich agus innealan ann (ùird naidhlean seach fiodha san latha an-diugh), agus eisimpleirean de phàtranan, air no tharraing sinn feadhainn againn fhìn. Abair gun robh sin tarraingeach, do dh’inbhich ‘s do chloinn. Chòrd e rium (agus ris na daoine bho ARCH) gu sònraichte mar a bha a’ chlann an sàs san obair, gun sùilean airson dad sam bith eile, a’ tarraing ‘s a’ gilbeachadh fad uair a thìde co-dhiù. Agus le toraidhean drùidhteach. Thàinig Barry mu thimcheall, a’ cuideachadh ‘s a’ toirt stiùireadh seachad. Bha mi a’ bruidhinn ris cuideachd mu ath-riochdachadh na cloiche ann am Baile a‘ Chnuic. Bha cuimhne agam mar a bha e ag obair oirre fad mu cheithir bliadhna, bho 2000 a-mach, a’ chiad taobh san t-seada mhòr agus an taobh eile air an làrach. Bha sinn ag aontachadh mu cho fìor chudromach ‘s a bha an cò-dhùnadh air a bhith an obair a dhèanamh anns a’ choimhearsnachd fhèin agus leigeil le muinntir a’ bhaile a thighinn a-steach agus coimhead air is bruidhinn ris fhad ’s a bha e ag obair. Mar sin ‘s ann dhan bhaile, dha mhuinntir na sgìre a bhuineas a’ chlach ann an da-rìribh, mar a bhuin a’ chiad chlach dhan choimhearsnachd Chruithneach. Mura b’ ann mar sin, nam biodh a’ chlach ùr air a cruthachadh ann an studio taobh a-muigh na sgìre agus dìreach air a toirt an sin nuair a bha i deiseil, cha bhiodh na daoine cho measail oirre no cho moiteil aiste mar phàirt den dualchas aca, an dà chuid eachdraidheil agus beò. 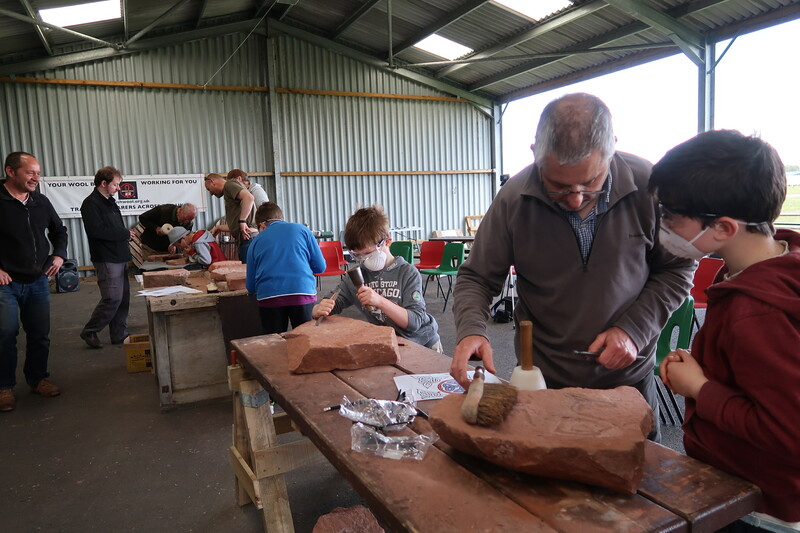 I was especially happy to get a chance to be at this workshop in Muir of Ord on 19 May, with Barry being the sculptor who carved the reproduction of our own Pictish stone in Hilton. 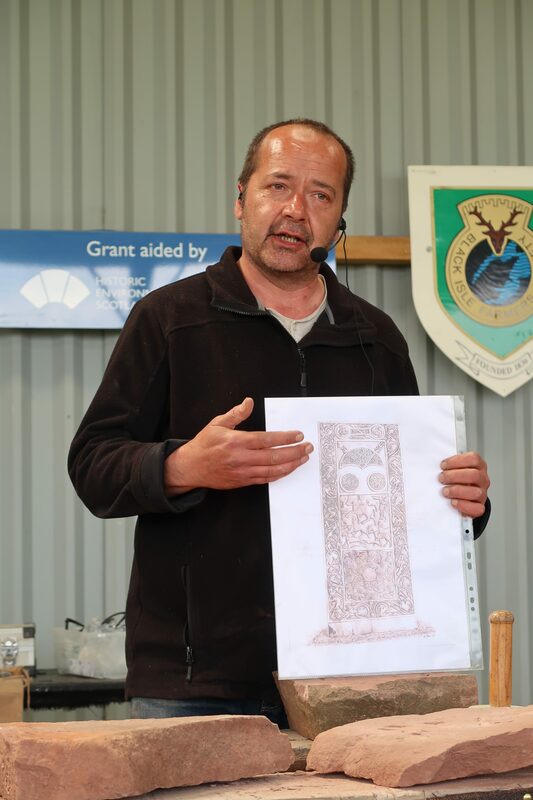 The event was organised by ARCH (Archaeology for Communities in the Highlands) as part of the series “Experimental Archaeology”, illuminating the skills and technologies of centuries past in a practical way. As there were people there, adults and children, who were not as familiar with the Hilton stone as we are, Barry began by recounting the story and the travels of the original stone, from the Picts who carved it in their own community on the Seaboard, to the nearby St Mary’s Chapel, to Invergordon Castle, to London, and to Edinburgh. 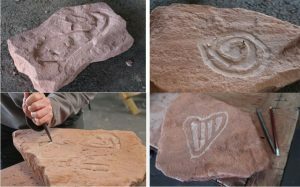 He showed a large drawing of the of the carvings on the stone and explained how skilful and how precious they are, although the experts don’t really know what the symbols mean. Regardless of that, the images are beautiful and powerful, still fascinating up to our own day. 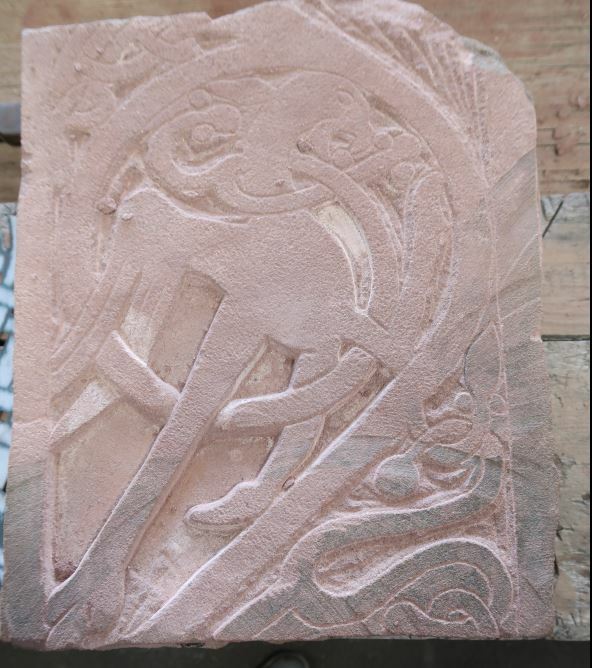 Then he began to demonstrate to us how the Picts – and he himself – did the carving, with simple tools: a mallet and chisels. 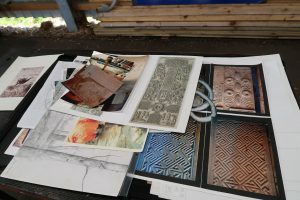 First you have to draw the detailed pattern on the slab, then you cut a careful outline to secure the edge of the image. And now we were allowed to have a go! There were pieces of sandstone and tools there (nylon mallets nowadays, not wood), and sample patterns, or else we drew our own. That was absolutely fascinating, for adults and children. I was particularly delighted (as were the ARCH people) to see how really involved the children were in the task, with no eyes for anything else, drawing and chiselling for an hour or more. And with impressive results. Barry came around, helping and giving guidance. 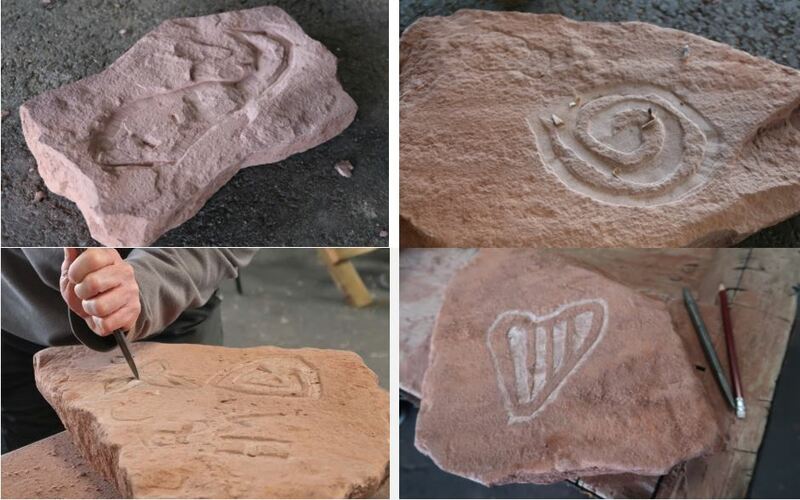 I was speaking to him too about his reproduction of the stone in Hilton. I remembered watching him work on it for about 4 years, from 2000 on, the first side in the big shed and the second on site. We agreed that it had been a really important decision to carry out the work in the community itself, and to let the people of the village come in and watch him and talk to him while he was working. In that way the stone came to really belong to the village and the people, just as the first stone had belonged to the Pictish community. If that had not been the case, if the stone had been created in a studio outside the area and just brought in when it was finished, people wouldn’t have developed such affection for the stone or been so proud of it as part of their heritage, both historical and living.